Microscope Gallery is pleased to welcome back to the gallery Columbus-based filmmaker Roger Beebe for an evening of films, videos, and multi-projector performances, including several New York premieres shown alongside some of his best-known works. The event is the New York leg of Beebe’s 3,000-mile East Coast tour. The program has been adapted to include only works never before presented at the gallery. In his works, Beebe often reflects upon forms of technology that are disappearing, or potentially being replaced – text fonts, books, moving image mediums, real estate – and critically considers their infrastructures and “replacements”, such as Amazon.com’s fulfillment centers in his 2018 “Amazonia” (NY Premiere) or the new high rises of Las Vegas, now the US city with the largest rate of suicide, in “Money Changes Everything” (2010). 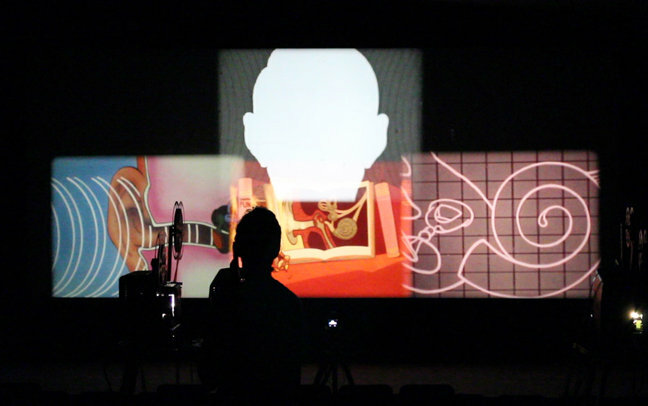 Beebe’s 2015 performance work for six 16mm projectors “SOUNDFILM” presents a usually unseen history of sound and its recording, focusing on its visual translation on the film strip and measuring instruments, as sound to be seen on screen. His seven projector “Last Light of a Dying Star” (2008-2011), originally conceived for a planetarium, through meticulously juxtaposed original and found footage reveals how light, space, celluloid film, early space explorations, expanded cinema, and ephemerality are intertwined. Beebe will be available for Q&A following the screening and performance. Roger Beebe’s work since 2006 consists primarily of multiple projector performances that explore the world of found images and the “found” landscapes of late capitalism. He has screened his films around the globe at such unlikely venues as the CBS Jumbotron in Times Square and McMurdo Station in Antarctica as well as more likely ones including Sundance and the Museum of Modern Art with solo shows at Anthology Film Archives, The Laboratorio Arte Alameda in Mexico City, and Los Angeles Filmforum among many other venues. Beebe is also a film programmer: he ran Flicker, a festival of small-gauge film in Chapel Hill, NC, from 1997-2000 and was the founder and Artistic Director of FLEX, the Florida Experimental Film/Video Festival from 2004-2014. He is currently a Professor in the Department of Art at the Ohio State University.